Many of the Weinbaugebiete ("Wine Regions") are far from being purely agricultural land. Most of them have a distinct culture that has grown over centuries in a symbiosis with wine, which often made areas prosperous and contributed to the presence of impressive architecture. This in turn often had a very positive impact on tourism, as so many wine districts co-localise with some of Austria′s most charming spots. In the following, I will outline where the individual Weinbaugebiete are; and what else beyond wine you can expect there as a tourist. Starting with the Weinbauregion "Weinland Österreich" in Lower Austria and the Burgenland, the district Wachau is among the top-destinations for tourists. The Wachau follows the bends of the Danube river on a distance of 33 kilometres from Melk to Krems and the side-valleys of the Wachauer Gräben. There are gentle hills that add a nice touch to the landscape, but most tourists come for cycling and stay by the river. In the Wachau, you will also find great orchards, especially for the famous local apricots. A special place is the vineyard of the Dinstlgut, possibly the oldest of Austria. It dates back to 860 AD, when its foundation was formalised through Ludwig der Deutsche. Melk, Dürnstein and Krems are famous for their baroque architecture and historical heritage. Wine aficionados know the Wachau for its local association "Vinea Wachau Nobilis Districtus" (also called "Vinea Wachau" - http://www.vinea-wachau.at/), whose watchful eye guards the exceptional quality of specialist wines like the Steinfeder, Federspiel or Smaragd. A local grape that was raised here in the 1860ies is the Neuburger. The Spitzer Graben area is famous for its high-quality Neuburger wines. From the Wachau, you can easily go to the districts Kremstal and Kamptal, known for their Grüner Veltliner and Riesling. They are north of the Danube and in the North of Lower Austria, respectively. These two districts as well as the Traisental (north of St. Pölten to the Danube) are best explored by your own mean of transport and offer less beyond wine than the Wachau does. On the other hand, these regions are less touristy and therefore, might offer a quite backdrop. The district Donauland stretches along the Danube between Krems and Klosterneuburg. 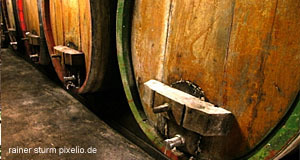 The most common wines are Veltliner, Weißburgunder and Zweigelt. The area is fairly close to Vienna and offers some nice cycling routes. The district Weinviertel is in the most north-eastern part of Lower Austria and mostly known for Grüner Veltliner, Welschriesling and Zweigelt. It is a very remote area that will offer good opportunities for soothing walks and rustic meals. 18,000 hectares of vineyards make the Weinviertel one of the biggest wine producers in Austria. Tour 2: Wine region "Weinland Österreich"
The district Carnuntum is south-east of Vienna (which is a wine region by itself). This is where the biggest town of the Roman province Noricum was (its name was Carnuntum). The dry, sandy soil and mild climate make very special Grüner Veltliner, but even more so Blaufränkischer and Zweigelt. There are only about 900 hectares of vineyards in this district, but you will find other ways of staying entertained. The Roman excavations are well worth a visit and the exhibition and displays great fun for children. The district Thermenregion is characterised by limestone and some volcanic strata. Here you will find sources of mineral water, hot springs and the wines Weißburgunder, Neuburger, Zierfandler and Rotgipfler. Combine a visit to the Thermenland with a trip to the Nationalparks Donauauen and Neusiedlersee or the castles of Güssing and Schloss Esterhazy Castle in Eisenstadt. The two neighbouring districts Neusiedlersee (north and east of Lake Neusiedlersee) and Neusiedlersee-Hügelland (around Rust and west of Lake Neusiedel) are known for a variety of excellent white wines. Try the sweet and intense dessert wines like Traminer, Gewürztraminer or Spätlese. Exquisit are the Beerenlese and Eiswein. Stop by the National Park′s visitor centre to learn more about the region and think about going to Sopron in Hungary for a short trip. Rust near the Seewinkel is a scenic village famous for its stork nests. It also has the classic outline of a traditional village of the region ("Angerdorf" style, with semi-detached houses for protection). St. Margarethen has a quarry full of artwork that is used since Roman times. The Mittelburgenland district (central Burgenland) is known for the Blaufränkischer and so is the district Südburgenland (southern Burgenland). In the latter one you will also find good Zweigelt and Welschriesling. This are is very remote, but has some nice villages, castles and access to Styria. Styria has a total of 3280 hectares of vineyards, which account for about 6.8 percent of the nation′s total. The climate is mild and rainfalls low with about 1,000 millimetres per year. Styria is big into white wines, 75 percent of the vineyards are planted with white grapes. The most important ones are the Welschriesling and Weißburgunder. The region is subdivided into the Südoststeiermark (between Hartberg, Fürstenfeld, Bad Radkersburg and Klöch) known for its volcanic soils, Traminers and Chardonnays (Morillon); the Südsteiermark (border area with Slovenia, Leibnitz, Sausaler Wine Area) known for sandy and limestone soil and a southern European climate; and the Weststeiermark (hills between Deutschlandsberg and Stainz), with varieties of Schilcher and Blauer Wildbacher. The wine culture of Styria is more rustic than in Lower Austria or the Northern Burgenland and less dominated by vineyards, as agriculture is more diverse here. Local wine bars are called "Buschenschanken" rather than "Heurigen" and are famous for generous meals (try the bacon-based "Verhackert" on Kürbiskernbort bread), affordable prices and friendly people. Beyond that, there are plenty of impressive castles (for example the Rosenburg) and the miner′s town of Leoben nearby for historic involvement. For a day off the wine-business, stop by one of the seven spas of Styria (Loipersdorf, Bad Waltersdorf, Bad Radkersburg, Bad Blumau, Köflach, Gleichenberg or Sebersdorf). Hot springs and wine have common grounds: the volcanic past of the region. The spas have generated a whole new genre of tourism in Austria, the "wellness tourism" that combines the pleasure of swimming in hot mineral water with saunas, beauty farms, massages and other treatments. They also allow you to do a "compromise" tour between wine vacation and family trip, as some of the spas are very children-friendly. A final word: If you are driving in Austria, the maximum part of alcohol in your blood that is allowed is 0.05 percent, more commonly measured as 0.5 per mille. I would advise you not to drive after drinking at all. Staying in the wine areas will allow you to experience rural Austria and save you of the necessity of driving to a city after some glasses of wine. Drink responsibly and refrain from driving drunk. More in the region: "Road of Castles" & "Spas of Austria"